André Bazin once wrote of Vittorio De Sica’s Bicycle Thieves (Ladri di Biciclette 1948): “The scenario is diabolically clever in its construction; beginning with the alibi of a current event it makes good use of a number of systems of dramatic coordinates radiating in all directions.” (1) Bazin praises the beauty and simplicity with which De Sica infuses his story—of a man desperately searching the streets of Rome for his stolen bicycle—with a social message without ever trying to make that message explicit. Rather, the social situation of high unemployment and corruption merely surrounds De Sica’s protagonist in an atmosphere, an atmosphere which exerts pressure upon him from all sides, without ever actually requiring him to confront particular issues consciously or directly. De Sica shows how these pressures exert their influence upon this man, pushing and pulling him in “all directions”, while he remains single-mindedly focused on his task, never stopping to question the social structures that placed him in that situation in the first place: that’s a task for the viewer. 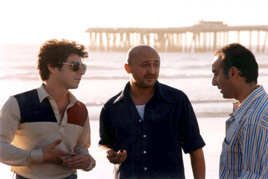 In his debut feature, America so Beautiful (2001), Iranian-American director Babak Shokrian manages to surround his central character in a similar degree of atmospheric pressure, by situating his own “diabolically clever” scenario in the context of a politically and socially significant event—the 1979 US Embassy hostage crisis in Tehran—without ever allowing that event to take centre stage. The scenario itself is very simple: Houshang (Iranian pop sensation Mansour) is a young Iranian immigrant living in Los Angeles. The year is 1979. Not only have political tensions between the USA and Iran reached a climax, but the US disco craze has reached its peak. Houshang is unsatisfied working in his uncle Hamid’s (Alan DeSatti) shop and dreams of buying a share in the profitable disco scene. He has arranged to do a deal with a local disco proprietor, Sahmi (Houshang Touzie)—who is involved in a rather complex subplot of his own—and has only a few days to come up with the money. Accompanied by his loyal and sensible friend, taxi driver and would-be medical student Parviz (Fariborz David Davoodian), the film follows Houshang as he sets out on his single-minded quest in the pursuit of his own American dream. These issues are not so much confronted but felt in America so Beautiful, and the film is important for the way that this political and racially-charged atmosphere is manifested very gradually but tangibly through the effect it has on this small community of Iranians during the course of the film. For the duration of the hostage crisis, special television and radio bulletins were broadcast daily to American audiences, and had the effect of bolstering morale, patriotism and national pride amongst the American people. Shokrian includes a number of these bulletins at crucial points within the diegesis, although his characters remain virtually oblivious to them. This is a very conscious and clever strategy on the part of Shokrian, for it enables him to show the dark side of patriotism as a very subtle and insidious form of racism, and it shows the very reactionary ways that national pride can serve to alienate immigrant communities, especially during times of crisis. In addition, this strategy raises questions regarding who the news is written to address, and highlights the fact that whole sectors of the community can often be excluded by the mode of address adopted in the media. 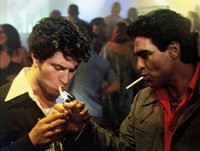 But the fallout of these political events and the swell of patriotism is felt throughout the film by all of the characters, and not least in the seemingly superficial domain of the disco scene. 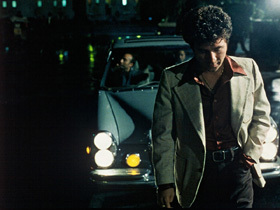 In fact, within the film, the disco scene can be read as a metaphor for American society itself. It is the place where dreams are born and played out, where loves are won and lost, but it is also a place from which certain ethnic groups are often excluded. On his first visit to the disco, Houshang is given an important lesson by the barmaid Lucy (Diane Gaidry). In this scene, Lucy explains the importance of not identifying as Iranian and of adopting a pseudonym such as ‘Disco Danny’, whose real name is Daryush or Jamsheed who goes by the name of ‘Jimmy’, and she promptly dubs him ‘Hank’. Sahmi advises him that if he really wants to make it in the disco scene, then he should do as he does; identify himself as Italian, and wear Italian suits. And later, when Houshang attempts to take the whole group on a tour-de-discos, they are asked by the doorman “are you Iranian?”. “No, we’re…we’re Italian”, answers Houshang, and Parviz calls out from behind “and I’m Irish”, in a contemptuous manner and with a less than convincing Irish accent. In a humorous but ultimately poignant way, Shokrian manages to show how, despite America’s supposedly egalitarian ideals, this reactive society can simultaneously alienate individuals from their own culture and from their adopted one as well. But this theme of exclusion from the disco/America is perhaps given its most poignant symbol in the seductive red velvet rope, the flimsy boundary that separates the inside of the disco from the outside. Like the glossy image of America exported to the rest of the world, with its ideals of liberty, justice and equality, which serves to tempt people to its shores, so too the rope hangs there as a temptation, just asking to be touched. And this is exactly what Bahman (Ali Reza Momeni), the group’s most recent arrival from Iran, does. Seduced by the glistening softness of the rope, Bahman reaches out to touch it, and as he does so, defenses go up and war erupts on the steps of the disco. Our group have no choice but to flee. “I only wanted to touch it”, says Bahman in defense: simple gestures can sometimes have cataclysmic effects. From here on, the atmospheric pressure builds through the rest of the film, pushing the group closer together, but this forced proximity does not help them to figure out who they are, where they belong or even where they are going. It forces the group to implode, and they end up taking out their frustrations on one another. The external pressures exerted by the volatile political environment have finally begun to break apart this small community of friends, and this too will have cataclysmic results. America so Beautiful asks us to think about and question the uses of political power in society, and more importantly, to reflect upon the ramifications that political events have for individuals in society. Indeed, as I watched the film at the 2002 Berlinale in February, I could not help but think of the treatment of refugees by the Australian government, and the way that government has been generating and fostering very subtle and insidious forms of racism for their own political purposes since the so-called Tampa crisis and “children overboard” scandal in late 2001 in the lead up to the federal election. The world needs films like America so Beautiful. Not only does the film manage to bring important issues about immigration, identity and America-Iran relations to the surface to be discussed, but this independent film, made for under 1 million US dollars, serves as a testament to the fact that important and potentially influential films are still being made outside of Hollywood, a fact that should hopefully inspire other young filmmakers to find the courage to tell their own stories. In these marginal production circumstances, Shokrian has made a richly layered and intelligent film that is as entertaining, humorous and moving as it is questioning of political, social and cultural issues, issues that need to be discussed right here, right now before it is too late. This interview evolved out of a conversation between Shokrian and myself that took place in Berlin on 9 February 2002 at the 52nd Berlinale, and was subsequently conducted via email during March 2002. Michelle Langford: When did you first develop the idea for America so Beautiful? What came first, the desire to make a film, or the need to tell this particular story, with film being the best medium for doing this? Babak Shokrian: I have to say the desire to make a film came first, but I was really mainly interested in making films about my own culture. As the desire grew, I became more interested in the immigration process, bicultural characters, such as myself, and how we deal with that. I made a short film on the same subject. A thirty-minute film on 16mm called Peaceful Sabbath (1993). ML: I read in your bio that you have a background in anthropology. What inspired you to make films and to what extent does this background inform the way you make films; the way you represent your culture and the interpersonal and social relationships between individuals? BS: Other films inspired me to make films. I love the films of Fellini, Pasolini and most of the Italian neorealists. I found something very “close to home” about these filmmakers. Anthropology gave me a chance to study various cultures, people, interactions and behaviors. The characters and customs within my own culture have always fascinated me. It made sense to make films about “us”. I feel deeply compelled to embrace the generation before me, my own generation and the generation after me, to try and understand it, come to terms with it and to capture its essence. It is difficult to explain but it really comes out of love and the need to show this to ourselves and the rest of the world. ML: When, and under what circumstances, did your parents decide to immigrate to America? How is your case typical of other Iranians of your generation living in LA? BS: My parents brought us to America well before the Revolution of ’78-’79. We came in ’71 and it was purely for the old “American Dream”. My uncles had moved here and were doing business importing oriental rugs from Iran and all over the world. Business was very good in those days and immigration was much more welcome and easier than today. My father just followed the natural course of the immigration process and it worked out for them, but not without certain costs, and I don’t mean money but change of life, belief, expectations one might have for their children and preservation of heritage and culture. Although, I think my father did okay, not every family, especially ones that came later in the ’70s, were as fortunate. ML: What connections do you maintain to Iran, and how do these connections influence your work? BS: My personal connection to Iran is through the culture and the people; the language, the spirit and the faces. I wanted to bring these faces to the screen. Coming here as a very young boy, I suppose I have a need to maintain the connection. I can’t really explain it. It’s just something from inside. My goal was/is to make films about this community even though people keep telling me I should do something more commercial or even more artistically abstract. “Why make films about Iranians? Who cares?” This comes from Iranians. I think it’s sad when a community thinks they are not worthy enough to be represented in modern cinema. But I think it’s the main, or perhaps only reason why I want to make films. Why would I compete with what Hollywood does so well? That world doesn’t need me. I hope this one does, and I mean that in a good way. ML: I’d like to ask you about the idea to set the film in 1979, with the American Embassy hostage crisis in Tehran forming the historical background, but with the disco craze as the film’s foreground. What came first disco or politics? Did the story develop from this context, or did you choose this context as a way of adding historical depth to what would otherwise be a rather conventional story about a guy trying to buy his little piece of the American Dream? BS: I chose 1979 crisis because that’s when the mass migration of Iranians took place and it was also the most difficult time to be an Iranian in America. A time when many Iranians hid their identity to survive. Of course, ’79 was also the apex of the disco era, which as a background, I find very colourful and a great parallel to the politics of the time. It was an aesthetically strong cultural moment for me. Finally, it just seemed like the best way to tell the story with some fun, some colour, humour and to weave in the politics without banging the point over peoples’ heads the entire film. ML: Could you say a little more about how you developed the film? BS: I first developed the idea here in LA with a producer friend of mine who ended up not producing the film because I guess it just took too long. I developed the idea here and then moved to Paris, where I finished the first two or three drafts. It was my first attempt at a full length script and I didn’t completely trust myself. I came back to LA and started to work with a friend, Brian Horiuchi, on more drafts. I felt like I needed to work with someone and not continue working in a box by myself. I welcome feedback and sharing ideas, the give and take of collaboration, especially when one doesn’t have the arrogance or experience of trusting oneself creatively. Anyway, I kept at it until I was able to find a producer willing to work with me, the right actors for each part and finally the money to make it all happen. The story developed from a cultural perspective first then the political context and we used a more conventional Hollywood structure to tell the story. I think I wanted to make an Iranian film in America more accessible for the American audience but also to show Iranians in America an image of themselves in a more conventional and Western style which we are not used to seeing very often. We (Iranians in America) only see Iranians in cinema from Iran and that’s not ‘us’. Actually, a lot of Iranians in Iran would also agree that what we see coming out of Iran is not a complete representation of “them” either. So, I don’t know, it’s a long discussion. I don’t want to digress too much…but I hope the film wasn’t too conventional. ML: Did you receive a lot of support from the Iranian community in LA? Is there other work being done in the community that tries to address some of the social and political issues faced by Iranians in America? BS: The Iranian community was very much behind us and a lot of people wanted to be involved. Unfortunately there wasn’t room for everyone. But it was great to see the enthusiasm. There hasn’t been too many Iranian/American projects which is why I felt inspired to make an Iranian/American film. There’s so much talent and so many who have the desire to express themselves artistically but not the resources. I think it’s changing. Maybe it took 20 years of displacement before change could take place. 20 years for the culture to figure things out. I’m talking about cinema. There have been many plays on stage by writers and actors in LA who came from Iran and many write about the displacement and the exiled community. I’ve seen a few of them. A few are pretty good. Many are just plain silly comedies with heavy handed messages that come in the end: I hope I’m not describing myself! ML: I certainly don’t find your film heavy handed, in fact one thing I particularly like about the film is how successfully you manage to keep the political/historical context at the very edges of the film, offering a few knowing glances to the informed viewer. It strikes me that this was as much an aesthetic decision as it was a desire not to make a historical/political film as such. The fact that your characters barely even notice these events unfolding around them gives me the impression that you were trying to infuse your characters with a kind of blissful ignorance, so that the illusion of the American dream can be maintained to some extent, even though, as the viewer becomes acutely aware, it is literally falling down around them. The rather ragged Uncle Sam figure who appears briefly in the background of one scene serves as a beautiful metaphor for this. To what extent did you conceive of Houshang’s fresh, childlike naivety as a way of highlighting the disparity between dream and reality? BS: I have to throw the first part of your question back to you because you have hit the nail on the head with your analysis and I really can’t add much to what you have said. Mind you, this is not to say Parviz exemplifies every immigrant who has ever crossed over into America or a new country. This is one person’s experience who might share the same views as some others before him or after him. ML: Talking about shared experiences, to what extent did your own struggle to raise the money to make the film mirror the stories of Houshang and Sahmi? But unlike your two characters, at what point and through what means did it actually become possible to achieve your dream? BS: Yes, like Houshang, I struggled to raise the money and bring all the people necessary to realize this dream. It became a conscious mirror and the script was slightly tweaked to that effect. I suppose where reality really took over from the dream was when I took control of my own life. When I began to believe in myself rather than looking to others to be saved. This involved a hyper-focused and honest approach, which was quite often very painful. In a way I’m still trying to achieve the dream. It seems like the dream is not complete until one’s film has been noticed and distributed. To pay back investors who doubt you – that would be a dream come true. But ultimately making and finishing a film one sets out to make is truly a miracle and a blessing. ML: Did you film mostly on location in LA? What was the shooting time? To what extent did the production rely on goodwill on the part of the community and the cast, who I understand worked for free? BS: We shot everything in LA. 22 production days and 4 pick up days after most of the editing was done. The main actors all worked for free, except for Houshang Touzie, who played Sahmi, who had to be paid. We didn’t know each other so well at the time. Now, he might. We are actually working on a new project together. He’s very funny and talented. ML: Babak, could you perhaps say a little more about the way you worked with the actors. The film has very much the feeling of a Kammerspiel, with a small ensemble cast and a somewhat episodic structure. I understand that most of the cast also work in theatre, traces of which can be detected in the styles of acting used in the film. In key scenes (Sahmi’s meeting with the General, the montage sequence showing Houshang’s attempts to raise money using repetitive framing devices, and several of Parviz’s key scenes, which often function like dramatic monologues) the performances appear often to be slightly stylized and theatrical, offering, I believe, a degree of distanciation (in the Brechtian sense), somewhat in the manner of, say, Rainer Werner Fassbinder. To what degree was this a deliberate, aesthetic decision on the part of you and your cast? Did you have a lengthy rehearsal process? BS: We rehearsed for about six or seven months while raising money for production. This brought us very close together, which I think helped the film. We became our own “dysfunctional family,” as one of the actors observed so well. As the director, I really just wanted the actors to feel as comfortable with the lines as they possibly could. Considering that it was most of their first times in feature roles or in front of the camera, I just wanted them to feel as natural as possible. If some parts felt stagy, I’d say that probably comes from the writing. It could have been an organic thing of my own. Sometimes style is born from instinct. I just hope I had more hits than misses. ML: One of the characters who intrigued me the most was Parviz. He appears to have an access to history and cultural knowledge, and to maintain a strong connection to his homeland, which the other characters appear to have lost. He seems to balance out the naivety and obsessiveness of Houshang and has the ability to see the situation from the outside. I think the story he tells on the hill while taking a piss is important. He tells the story from the Bible concerning Abraham’s desire to have a son, and Sarah’s apparent inability to give him one. In a way it serves as Parviz’ own ‘sermon on the mount’, because while he demonstrates that he knows the ‘real’ story (he’s read the book), he gives it a comic and anachronistic ending, partly because he knows the others aren’t taking any notice anyway, and partly to show the incompatible levels separating one’s cultural past from their present situation in America. From your own experience and those you depict in the film, to what extent do you think American society alienates immigrants from their cultural heritage? Is this alienation something you were trying to show in the film? BS: Alienation of cultural past from the present is a very big part of the film for me. I like your interpretation of Parviz’s story on the hill by the way—exactly right! I believe this is the risk of immigration, especially in America where McDonalds and cartoons can consume a culture’s cuisine as well as teaching their own language and literature, all out of convenience. Don’t get me wrong, I like cartoons and burgers. I just mention it because it is one of the risks of migrating to a new world. My mother always held on to as much of our Persian culture as she could. Especially the language and the food. It must be a battle for immigrant cultures to hold on to the past. The cabaret scene is one case where we tried to show this alienation. Our gang has had no luck all night trying to fit into “America” (the disco), so they decide to go and be with their own food, people, music: a place where they can finally feel safe. But as we see, that doesn’t work out for them either. Because of an unconventional or disrespectful act [Parviz dances with another man’s wife], our gang gets kicked out of the cabaret just as fast as the discos. They are neither here nor there: a generation alienated from their past and their present. They can’t figure out who they are and where they belong. So ultimately, their frustrations turn towards each other. ML: Has making the film helped you to figure out who you are and where you belong, or will that always be an ongoing process? BS: Has making films helped me figure out who I am and where my place is? Good question. I don’t know. I suppose I haven’t made enough films to find out. I think it definitely helps. But the way I feel today, it’s most likely going to be a life long process. Hopefully I’ll get a chance to make more films. Hopefully I’ll figure it out before the end. ML: And finally, it seems to me that although the title of the film contains no punctuation, the film itself implies a question mark. I’d therefore like to finish with the somewhat rhetorical question that the film itself posits: What is so beautiful about America? BS: What makes America so beautiful? Let me think about this one a bit. It’s a tough one. Not because it’s hard to find beautiful things about America, because there are many beautiful things about America, but because there are also things that are not so beautiful. At the end of the film I tried to show this. There’s a big part of the end which is true and not so beautiful. The very end of the film shows two events: Reagan being sworn in at the same time the hostages are being released. The hostages were released only a few hours after Reagan was sworn in on Jan 20, 1981. I feel that this was more than a coincidence. ML: Yes, I’ve read that Reagan’s team may have been involved in secret deals (possibly involving arms) with Iranian clerics to delay the release of the hostages until after the election. This is the same kind of manipulation of public opinion for political gain that we see occurring every day, like the way, for example, the Australian government manipulated and withheld information regarding asylum seekers in the lead up to the 2001 election. These kinds of games can affect people’s lives very profoundly by generating very subtle but very dangerous forms of racism within the community. BS: I believe that this was a politically choreographed deal that the Republican’s made with the Iranian government to not release the hostages during Carter’s presidency; defaming Carter throughout the year, plummeting his ratings and torpedoing his chances at a reelection. Not to mention, scarring an entire immigrant culture for their own gains. It’s been written about by many authors but not discussed very often. Some don’t exactly get the parallel. I’ve been thinking of adding subtitles over the images indicating this. Generations that were not even born would miss this concept completely. That concerns me. But you asked: “what is so beautiful about America?” There’s a lot of beauty in imperfection. This is one more thing I can’t quite put into words. But for me, I think the end of the narrative, where Houshang is given a second chance, shows some of what’s beautiful about America. Even when one dream fails, one can still wake up to another day with sunshine, with friends, a warm cup of coffee and a lot of colourful faces in the crowd. One is free to fail but free to dream again. Michelle Langford is a lecturer in Film Studies at the University of New South Wales. She has published on Iranian and German cinema and is the author of Allegorical Images: Tableau, Time and Gesture in the Cinema of Werner Schroeter (Intellect, 2006).